Sometimes, it is at the most unexpected places and in extraordinary situations that the smallness of your existence dawns upon you. One of those rare occasions made a house call just last week. 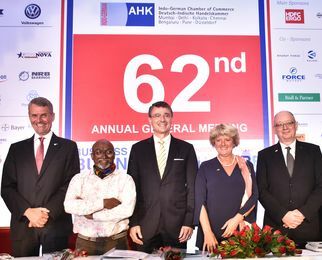 I received an invitation from Bernhard Steinruecke, director general, Indo-German Chamber of Commerce, to speak at the 62nd AGM of the chamber in Mumbai. I first met Steinruecke when he was director of the Deutsche Bank in Mumbai. Tata House, in the city’s Fort area, the residence of the Tatas till 1992, had just been restored. And Deutsche Bank opened their head office on the premises in 1995. To experience Deutsche Bank’s art collection was nothing but exhilarating. Deutsche Bank must be one of the biggest art collecting banks in the world. Steinruecke had great taste for art and was an avid collector. This was reflected in his personal life. He found his life partner in the Mumbai art world, the beautiful Ranjana Mirchandani. Ranjana and her mother, Usha, now run one of the best contemporary art galleries in India—Galerie Mirchandani + Steinruecke. I have seen the growth of the new tasteful gallery and one could notice that Steinruecke’s influence had transformed it. It was indeed a great honour for me to address the gathering at the IGCC, among whom was the chief guest Monika Grütters, German federal government commissioner for culture and the media, and minister of state to the German chancellor; Martin Ney, German ambassador to India; and the guest speaker Sabyasachi Mukherjee, director general, Chhatrapati Shivaji Maharaj Vastu Sangrahalaya, Mumbai (formerly the Prince of Wales Museum of Western India). I have immense respect for Mukherjee, for the commitment, passion and open-mindedness that he shows towards running the best public museum in India. To my chagrin, he says all of it is possible, and the museum is sustaining itself, because of the beautiful people of Mumbai. The subject of IGCC this year was business and culture. My talk was primarily about the Kochi-Muziris Biennale and how the fledgling event has turned out to be South Asia’s largest and the only ‘people’s’ biennale in the world. In fact, the IGCC is hosting its delegates in Kochi during the opening of KMB this year. I was pretty pleased with my presentation till my somewhat bloated ego was punctured. Thomas Fuhrmann, IGCC president and CEO, Grütters and Ney told me about how much Germany invests in culture every year. It is nearly €2 billion, which goes into the 6,200-plus museums and 800 opera houses they have. Not to speak of the year-round cultural activities and, of course, the art institutes. Last year, when Grütters announced a 23 per cent boost for annual national arts funding, she said that it was meant to emphasise how ‘culture is the foundation for our open and democratic society’. This year she got the German Bundestag to up it to €1.8 billion. Today, Berlin is the hub of culture in the world. Any art organisation worth its salt wants to have a foothold in Berlin. I personally know of artists from different parts of the world who have migrated to Berlin. I am not saying that we in India should be like Germany. In fact, we cannot come anywhere near even if we try. But what I am saying is that it shows how much Germany cares for its culture. The German parliament could dare to set aside that kind of money only because they are well aware of the fact that there would not be any public backlash. If we begin to care, our politicians will begin to dare!